The Art Deco trend sweeping Manhattan is now arriving in Borough Park. Permits have been filed for an 18-story mixed-use building at 4218 Fort Hamilton Parkway in Brooklyn. The site is two blocks away from the Fort Hamilton Parkway station, serviced by the D trains. Snap Developers NY will be responsible for the project, which YIMBY can now exclusively reveal. The 218-foot tall structure will yield 113,260 square feet, with 9,700 square feet dedicated to ground floor retail, and 103,560 square feet for an unspecified philanthropic community facility. Cycle Architecture and Planning are responsible for design. The wedding caked-envelope matches with metallic accents to yield something surprisingly detailed for the Outer Boroughs, in a hopeful sign for quality architecture across the Five Boroughs. Demolition permits have already been filed for the existing structure. The estimated completion date has not been announced. 5 Comments on "Rendering Revealed for 4218 Fort Hamilton Parkway, Borough Park, Brooklyn"
Please pardon me for using your space: I give you special attention on its rendering, also the details. Succeed in your revealed. That will be the tallest building in Borough Park. How many apartments? Wedding cake is not necessarily being art deco styling. It’s more like midcentury modern or postmodern of 1980-90s. It’s same styling as Metrotech buildings, same as Downtown Brooklyn Chase HQ. What art deco trend? I can think of maybe 2 or 3 buildings in the last year in development that are reflective of the style. Hope there is more to it than what is shown, because it is pretty dull without any details. It’s a commercial building, not a residential. So, it’s 218 foot height for 18 stories total will make this building the tallest one in the area of west from Flatbush. Even Prospect Expwy 18 story residentials have a lower roof, but Brooklyn is not Manhattan, it’s hilly borough, especially in areas of Park Slope Kensington Prospect Park, what’s a tallest hills about 200 feet high over the water!!! This makes even building built on their hillsides at 12-18 stories not a taller than any building built lowrise on the hilltop!!! And that building is a replica of midcentury modern revival of Metrotech Chase early 1990s construction, what’s have a true wedding cake structure and art deco looking elements on facade. 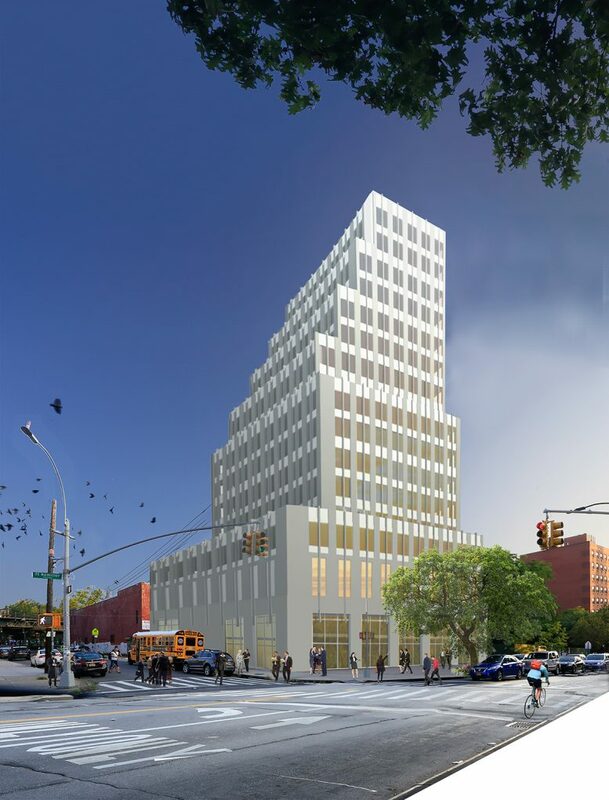 Anyway, being the tallest building in area and true high rise, over 200 feet tall tower with office use floors, this will bring a slice of Downtown Brooklyn in sleepy very struct religious neighborhood of Boro Park. The tallest building there so far is Maimonides Medical Hospital Complex, 9 story and probably about 120 feet, some 14-18 stories towers in north of Ocean Parkway Extension are tallest one on Skyline there, outside of Downtown Brooklyn, because they are built on top hill!! !